Facade Function Behind the Form | Grunau Company, Inc.
Every great architectural structure has two parts: The part you actually see and the part you don’t. Therefore the facade you see on retaining walls along freeways have hidden structural components that hold everything together. Grunau Metals recently modified some off-the-shelf structural steel components for rebuilding Interstate 94 in Milwaukee. 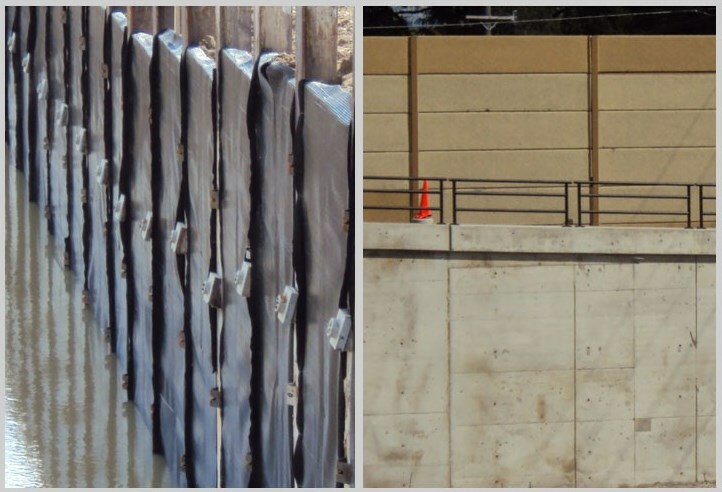 The highway’s retaining walls were constructed from vertical steel beams with a decorative concrete facade attached to them. Therefore, keeping the vertical beams straight with the added weight of the concrete facade required tie-rods set 20 feet into the ground. Those tie-rods are now installed behind the wall to help anchor the beams in place. The challenge for Grunau Metals was to cut and install special holes and brackets for the steel tie-back rods in each beam so that they would hold the walls true once the backsides were back-filled. The tie-rods would keep those beams straight-up forever. We wish we could have you look for these wonderful beams and tie backs as you drive on I-94. But alas, they are now strictly behind the scenes.